Living in a community, finding or having a sense of community, belonging to a community – these are some ways that I think of community from a personal perspective. As a military spouse, I move every few years and that certainly impacts my sense of community and how I approach each new place that I call home. As individuals, we have social communities that we belong to, and as educators, we are part of a greater community of professionals involved in teaching and learning. In the Leadership in Educational Technology course of this program, we discussed the distinction of learning in the collective versus belonging to a particular learning community. In my blog post, “Embracing the collective while bringing a sense of community” I shared my understanding of community in my personal life and how my participation in various collectives had evolved over time, particularly with the addition of social media. Exploring the possibilities of supporting meaningful and engaging learning experiences through social media can be exciting but also challenging; the pace of technology innovation combined with the dynamic ways that users have shaped the culture of information sharing can overwhelm even the most experienced educator. There is an infrastructure and character to a learning experience that is drastically different when it takes place in a virtual space with a wider, more public audience than inside a physical classroom. As educators, we need to understand how to use both (and everything in between) to facilitate effective and engaging learning environments and interactions. Everything we do in our practice boils down to how well we can manage and support a community of learners with the knowledge and tools and within the time and space (virtual or physical) we are given. In my UbD unit plan for my career exploration program, I build in many elements that foster an engaging and safe space for learning. We gather as a group for icebreaker activities to get to know one another, for team meetings that help us build consensus and make decisions, and for discussions to share ideas, resources, and reflections. We create a group agreement to articulate our shared commitment to support individual and group success, but we also adapt it as our needs and expectations change over the course of the program. There is an emphasis on giving each participant voice and choices each day and multiple opportunities to build skills and set priorities for learning. Group and individual activities help participants to identify and highlight their own unique interests, needs, and abilities and an emphasis is placed on individuals taking ownership over their own learning. The program is in fact a collective because participants enroll based on their interest in the content. At the same time, we intentionally build community within the group, throughout the program, to model for the young women how they can each contribute their own unique voice and perspective – they benefit and the community benefits from the engagement. The significance of this safe, engaging, and collaborative learning community was demonstrated to me when a young woman expressed frustration at the writing prompts we used to create first drafts of personal statements (for the college admissions process). The University of California Personal Statement Writing Prompt #1 says, “Describe the world you come from – for example, your family, community or school – and tell us how your world has shaped your dreams and aspirations.” The young woman told the group that the world she came from was not something she felt inspired to write about – her family had been broken up and were not supportive of each other, classes were challenging and she did not identify with any groups within her school, and in her eyes, her community was a neighborhood characterized by poverty and crime. The engaging discussion that ensued after her statements only highlighted the importance of the safe and inclusive learning community that had been fostered in the program. Participants bonded over their common challenges and we came up with some creative ways to address the prompt, around topics that would answer the question but still be meaningful for each writer. The young woman’s courage to express her despair, the group’s reaction in rallying around her, and the problem-solving attitude taken on by the group – all of these things taught me the value of learning to facilitate and support a learning community. It can be about giving learners a space and opportunities to step out of their comfort zone and it can also be about what learners need to thrive independently and collaboratively. Most importantly, I learned that cultivating a supportive, meaningful, and engaging learning community, is just as much about adapting to meet the changing needs, interests, and abilities of its members. My Diffi-Mooc internship reflection demonstrates that I met the ISTE (NETS-C) Standards aligned with managing a learning community. A major focus of the tools used during the Givercraft & Survivalcraft projects were to provide opportunities for differentiation throughout the experience. The MinecraftEdu gameworld was an ideal environment for differentiation but also presented many challenges for teachers and their students. I created differentiation tools and activities that would help teachers to meet the various gamer types, allowing each student to take ownership over their learning and interactions within the game. This was an unsettling and unfamiliar environment for teachers and I used practice sessions, tutorials, and structures and activities within the game to model how students could be supported and the game environment effectively managed. As the experience progressed, students began to demonstrate that they could learn quickly and adapt to the changing elements and environment within the game; they began to see themselves in the context of their class communities in the game as well as in contrast to other classes or groups of students who “co-existed” in other areas of the gameworld. Students and their teachers began to collaboratively solve problems, share information and resources, and prioritize their time in the game to accomplish tasks. By using the teacher tools and observing and supporting the dialogue in the game chat, I modeled effective game and behavior management, while also allowing all players to negotiate their behavior and interactions with others during each game session. I also used game management (teacher) tools to create structures and spaces that would facilitate routines and protocols that were needed for the experience to be successful but not too much that they would take away from the game flow. I observed students and teachers and provided help as needed, taught more advanced building skills to some students, and sometimes gave them specific supplies and tools to facilitate the game scenarios. I used Wikispaces pages outside of the game to share resources and reflect on student writing and screenshots; this was an important tool for modeling self-reflection, critical thinking, and demonstrating understanding of key concepts and ideas about the experience. The powerful impact of this experience was evident through my observations and in students products of learning (Wikispaces pages) which I captured in this artifact. Students and their teachers were able to effectively participate and meaningfully learn in a virtual learning environment because they were supported while immersed in the content. 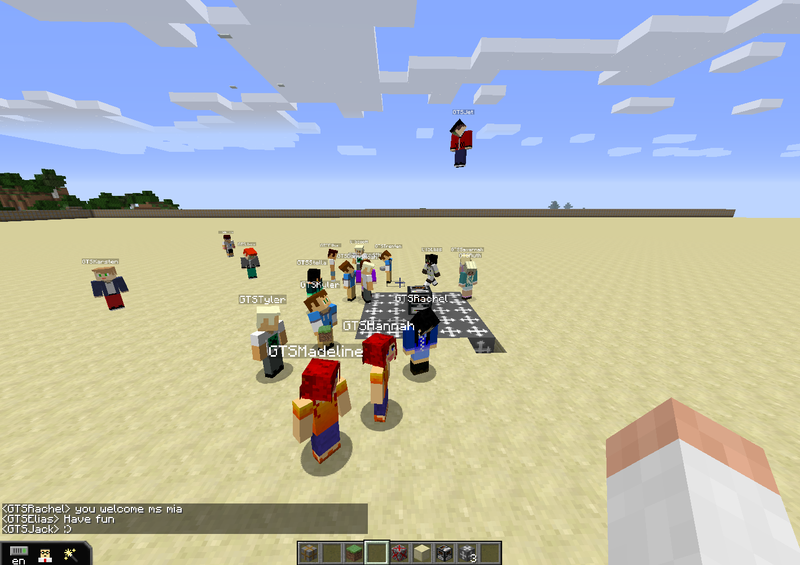 By designing and managing a dynamic, engaging, and collaborative learning environment within and outside of the MinecraftEdu gameworld, I was able to help students and their teachers to expand their understanding, experiences, and perspectives about learning.